← The KBIS debate – should it be censored? The initials P.K. stand for product knowledge. 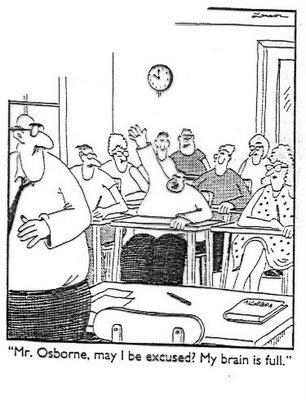 Just like the student in Gary Larson’s famous comic, the sales associates attending most PKs already have brains full of more information than they can possibly keep track of. They’re barraged by emails from suppliers with product and pricing changes and updates. Their desks and bookshelves are overflowing with brochures, catalogs, and binders. They’re responsible for multiple brands, not only in appliances, but often in plumbing and lighting as well. On top of all this PKs and other training efforts are geared towards adding as much additional information as an hour session allows. They are a futile waste of the sales associates’ and trainer’s time. Instead, these meetings need to cut through the clutter and be organized to make sales associates lives easier and simpler by improving their abilities to connect with and satisfy customer needs. Future appliance blogs on this site will expose some common training myths, and propose a shift in approach to PK trainings. The industry needs to scrap these old lecture based PKs, and replace them with training based on evidence-based educational methods, and proven training principles. Stay tuned, by subscribing to this blog by email. This entry was posted in Appliances, Business, Management, training and tagged education, PK, sales, sales training, training. Bookmark the permalink.